Wondering where to plan your 2010 vacation? Colorado, is a spectacular winter and summer vacation destination. Rent a Colorado timeshare at the Wyndham Pagosa resort and you'll be giving your family a unique vacation they'll always remember. Pagosa Springs is nestled along the San Juan Mountains in southwest Colorado, 30 minutes from the Continental Divide and 35 miles from the New Mexico border. This picturesque town is world famous for its hot springs, one of the largest and hottest natural springs in the world. Still celebrated for its therapeutic powers, the ancient Utes called these sulfur-rich mineral springs "Pah gosah" meaning "healing waters." The rushing San Juan River also flows through the heart of town offering exciting white-water rafting. 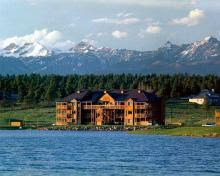 The Wyndham Pagosa resort sits on an incredible 18,000 acres of outdoor activity and beauty. Six tennis courts, an 18-hole miniature golf course, an 18-hole world-class golf course, and on-site lakeside fishing are just for starters. The Activity Center offers a variety of classes from watercolor painting to tai chi. Many hiking and biking trails, as well as horseback riding, will get you out into this breathtaking country. During the winter the nearby Wolf Creek Ski Area has downhill skiing for beginners to advanced, in a truly spectacular Rocky Mountain setting. World-class skiing is available at Purgatory Ski Resort just over an hour drive away. A 45-minute drive will get you to the town of Durango, Colorado, where you can ride the popular Silverton-Durango Narrow Gauge train. This coal-fired historic train has been in continuous operation for 127 years. During the summer the vintage train will take you on a journey from Durango to the high-mountain town of Silverton, through magnificent scenery that can only be seen by train. In the winter you can still enjoy the sites and sounds of a yesteryear train ride on its shorter Cascade Canyon winter loop. Also an easy drive from Pagosa Springs is the world-famous Mesa Verde National Park, home of the ancient Anazazi. Visitors from around the world flock to this extraordinary area of over 4,000 known archeological sites, including 600 cliff dwellings. Guided tours will take you through some of the best preserved cliff dwellings in the United States, where you can actually climb ladders up to living areas and down into sacred kivas. Colorado is known for its spectacular mountain scenery and year-round outdoor activities. By renting large variety of Colorado timeshares available, your family can experience the best of everything Colorado has to offer.